Enter Spring is the most accessible of Frank Bridge�s late works. This is not a faint-hearted dreamy portrait of Spring but a vigorous and vivacious evocation, full of energy and life, even wild and pagan in its huge climaxes. The evocation of the countryside waking noisily from its winter sleep is very realistic, you can hear massed choruses of full-throated birds singing joyfully in the hedgerows. Yet there is, in the central section a magical serenity that, for me, makes it one of the most beautiful passages of music in the whole of British music. Marriner paints a lusty and sympathetic picture but he is not quite as persuasive as Sir Charles Groves on the rival EMI set that also includes The Sea and Summer. On the surface Summer seems to be a more conventional depiction of the English countryside, slow and meditative and nostalgic of golden summer days but there is more to this middle period work, more than a sultry sensuous evocation. There is the same keen observation as in Enter Spring, the same rustling and warbling: yet there is also something more vital, and vaguely disturbing. All of this is nicely conveyed in Marriner�s sensitive reading; and what a glorious climax he shapes. The Christmas Dance � Sir Roger de Coverley is another work from Bridge�s middle period and it is an excellently crafted miniature for strings that is an arrangement of the British folksong, full of exuberance and a concluding reference to New Year celebrations and 'Auld Lang Syne�. Benjamin Britten was, of course, a student of Frank Bridge and the two men later became firm friends, Britten often visiting his mentor in his beautiful Sussex home. 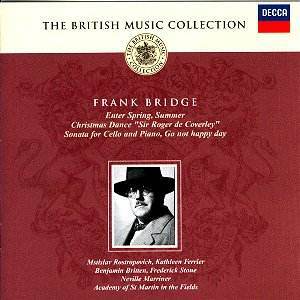 And, one will recall, that Britten composed his Variations on a Theme of Frank Bridge in his teacher�s honour. So this recording of Bridge�s Cello Sonata with Britten at the piano and Rostropovich has a particular resonance and intensity. The Cello Sonata comes from Bridge�s middle period and shows that he is embracing an increasingly wide range of stylistic references. It is accessible and melodic, one can hear something of Rachmaninov in its yearning and anguish. There is a little of Bax too, plus a dash of folk song, but it is pure Bridge throughout. The concert ends with the incomparable Kathleen Ferrier singing the lovely little song Go Not Happy Day, to words by Tennyson, with its contented rippling accompaniment. Enchanting. A worthy compilation of Bridge works from his middle and late periods: beautiful works splendidly played � especially the Cello Sonata by Bridge�s erstwhile student Benjamin Britten and Mstislav Rostropovich. Recommended.